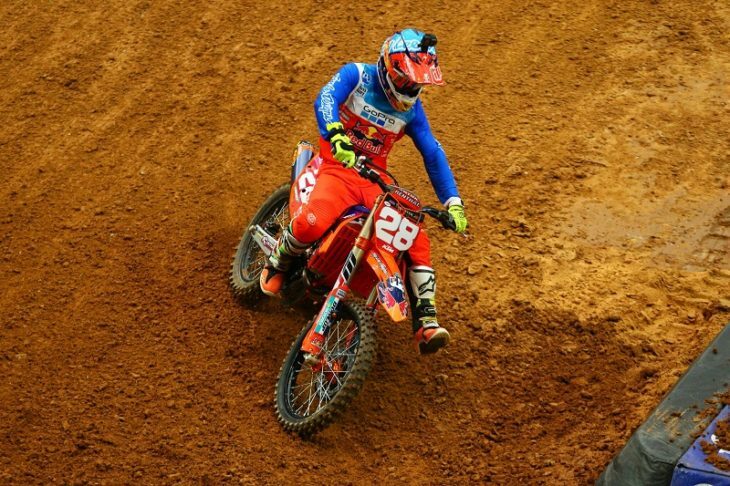 HOUSTON (January 13, 2018) – Troy Lee Designs/Red Bull/KTM’s Shane McElrath was the sole representative for the team at NRG Stadium for Round 2 of the Supercross season, finishing fourth in the Main Event on a deteriorating track. The conditions provided challenges, but McElrath kept it on two-wheels and left Houston just four points down in the Western Regional 250SX Championship. Teammate Alex Martin did not race in Houston and will be taking it week-by-week as he evaluates an injury sustained at Anaheim 1. McElrath started the day as the second fastest qualifier of the 250SX class as the series made its return to Houston for the first time since 2015. Like he did at the opening round in Anaheim, McElrath raced to the heat race win aboard his KTM 250 SX-F. He grabbed a great start in the Main Event and raced with the front-runners before settling in and tackling the tough obstacles on the Houston track. When the checkered flag flew, McElrath earned fourth and moved to second in the championship standings. The KTM Junior Supercross Challenge dropped the gate for the first time in 2018 and it was all Danny Robertson. Despite Robertson’s dominance, the rest of the field was entertaining to watch and it was Jayden Struble and Easton Theys joining Robertson on the overall podium.